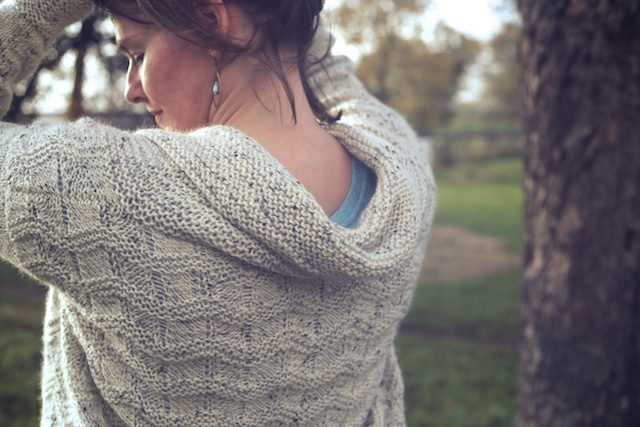 The Blowing Snow Cardigan is live. I even had the weather in which to wear it Sunday. I literally sat in church, before my group of teenagers got in the room, weaving in the last few ends. 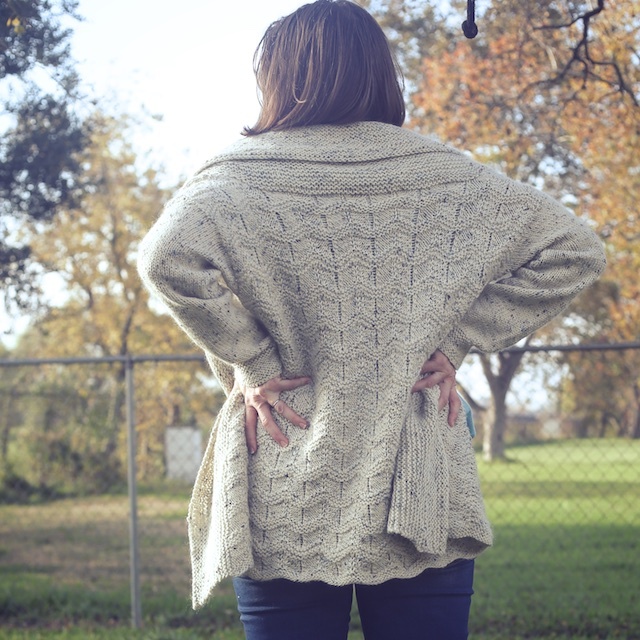 This cardigan is by Emily Ringelman and is featured in Midwestern Knits. I knew I wanted to make this when I first received my book, but I wasn't sure about yarn color. I like knitting with color. Especially at this point in my crafting life, where I've tried most every technique, so that's not always an incentive to get through a knit with a neutral color. I also wear things in lighter weight, and longer-to-knit, yarns. So sometimes it's the color that encourages me to power through a knit. That wasn't necessary with this one, though. The construction was interesting and the three different stitch patterns kept it interesting. I also liked the natural, semi-solid color of the sample for this design. It's something my own closet is missing. Of course, it looks much more subtle and smooth than the yarn I chose, but I had to go budget friendly at my time of ordering. My Patons Classic Tweed in the Aran color, on sale at Joann, was the closest I could get. I really like the little flecks of blue because it isn't a busy tweed. My other misgiving about knitting sweaters right now is what size to knit. As I think I've mentioned before, I'm going through "a change"- no, not the change, just stress-induced hormonal stuff that I made worse with hormone therapy experiments. 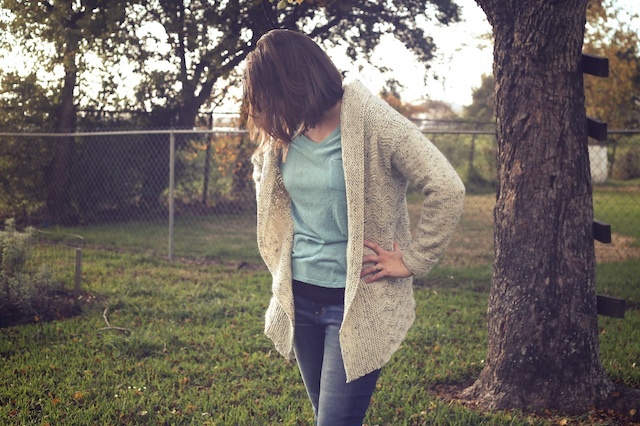 So, I want flexibility in my knits right now- things that will fit me if I continue to put on weight, and that can look intentionally oversized if I drop back down. This cardigan looked like a safe bet. 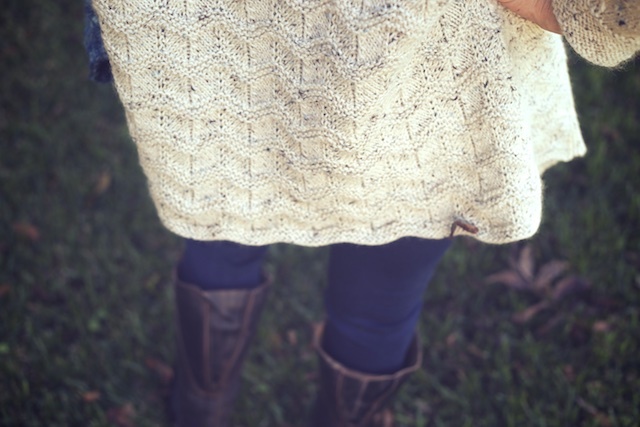 It also helps that I've always liked oversized sweaters. I used size 5 needles and added a bit of length to mine. My row gauge was pretty accurate, but my stitch gauge was off. I wanted a 36"- 40" size but knit the 30 - 34" at a larger gauge (about an extra stitch per inch). 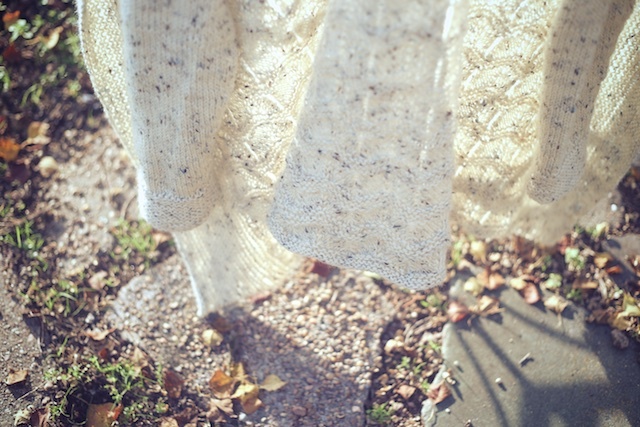 When I finished, and blocked, the body, it's measurements were perfect for the third size. However, the fronts didn't have as much coverage as the sample did on the model. Since that was the fit I was going for, I knitted 1.5"- 2" more into the front bands, half before working the collar and half after. This may have been a mistake. You may be able to see here that thmy cardigan completely fits, but the collar is a bit loose and too large for the body of the sweater. I think this is because I stretched it a bit while steam blocking to make sure it laid down properly. I think I was overzealous with the steaming and stretching, instead of being mature and doing a full wet block and dry. So, I'm going to do a true wet block then see how I feel about it. It wouldn't kill me to rip the collar back a ways and re-knit it, removing the extra length (which created width at the shoulders and length at the back). What can I say? I suffer from a typical #knitterissue: it turned cold, and I want to wear it right now, not wait for blocking. 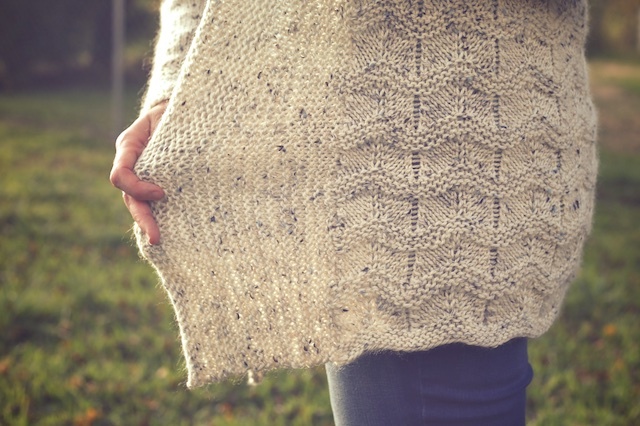 Isn't the wavy stitch pattern cute? My daughter, like the rest of my family, never focuses on what is in my hands if I knit around her. I could knit her a gift she's asked for, or a giant couch cozy, or a weird faux fur garter belt and it would just register as a pixelated, censor bar to her. And when I talk about what I'm knitting, it registers as a test from the Emergency Broadcast System. So, she had no clue I'd knit this sweater when I wore it to church and out to eat with them. She said it looked like an Anthropologie sweater. I take that as a compliment, even though I own some Anthropologie sweaters and I know I can do better than that. 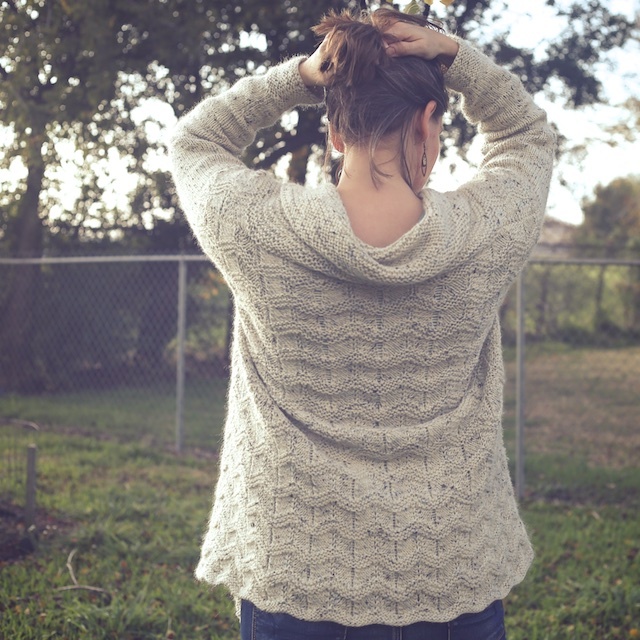 In fact, I looked for a sweater from their website that I could link to, as similar to this one, but there really wasn't anything. Most of what they sell I can find a knitting pattern that looks even better, unless it's a sweater knit with fine yarn on a machine or that involves sewn fabric. 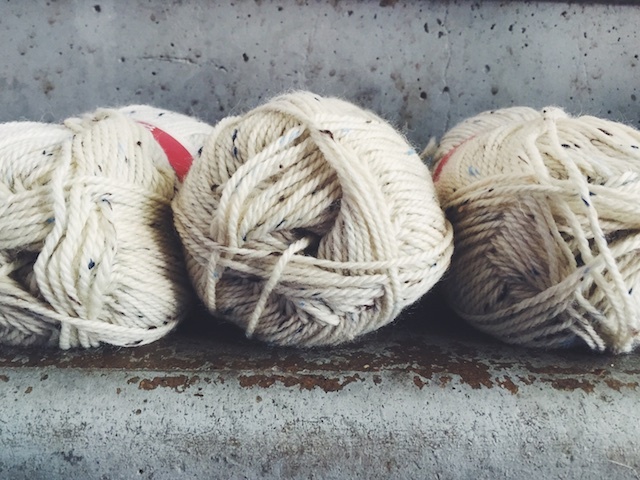 I feel certain I could knit any of them I wanted, and do it with higher quality. That's pretty cool, considering that store was the reason I decided to knit. I wanted to make something like what they sold, but for less. 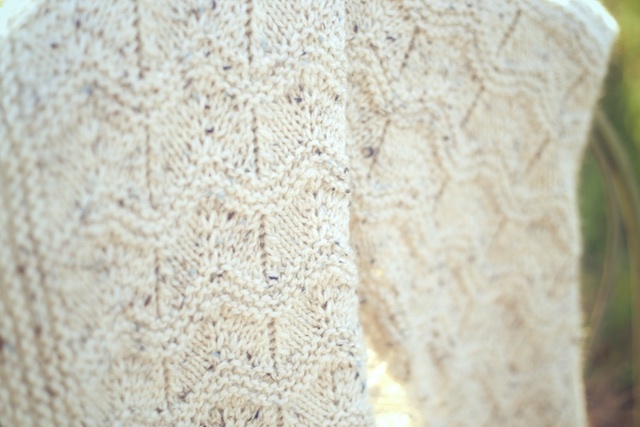 I knit my Blowing Snow along with a lovely group of knitters in the Midwestern Knits KAL group on Ravelry. 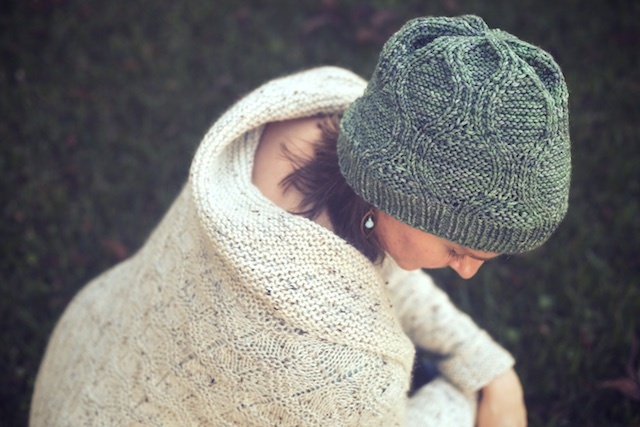 We've experimented with adding length, tweed yarn, variegated yarns, and even some sweater surgery the reduce length. We're a daring bunch. 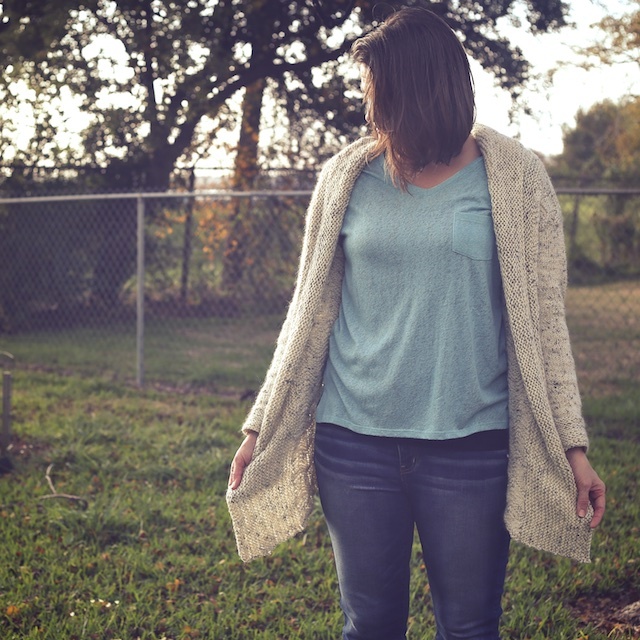 Other posts on this cardigan: yarn substitutes and the body.